Welcome to our newest listing - Ohana House, a beautiful home with high end finishes that is dog friendly and a short 3 minute walk to the beach. With 4 bedrooms and 4.5 bathrooms it comfortably sleeps 11 people and has plenty of room for parking up to 4 cars. We allow up to 2 well behaved dogs with a pet fee. When you first walk in you will find a wide entryway opening up to a large open concept floor plan. The living room has a vaulted ceiling, plenty of natural light, ceiling fan, a large wall mounted Roku tv, comfy couch and loveseat, and hardwood floors. It comes with wifi, books, games, and a Blu-ray player. The dining area had a table that extends out to seat 8 plus barstools at the kitchen counter. The kitchen has granite counter tops, stainless steel appliances, and plenty of countertop and cabinet space. The master bedroom is also on the main level and has a king size bed and features a walk in closet, gorgeous on-suite master bathroom with a large soaker tub, separate sinks, and tiled shower. Also on the main level is the laundry area with a full size washer and dryer and a half bath. Upstairs is the second bedroom with a queen bed, the third bedroom with bunk beds, twin over full, a hall bathroom with tub/shower, and a landing area with couch and futon. Both bedroom have tvs and ceiling fans. The home has a full front porch, covered area with picnic table, outdoor grill, outdoor shower, and plenty of parking. Gather your beach gear and take the short 3 minute walk to the beach right across the street. We are located on a quiet stretch 1 mile south of the Kure Beach pier and right next to historic Fort Fisher (Civil War museum and grounds) as well as the NC Aquarium. Our island has two boardwalks, two piers, plenty of seafood restaurants, a grocery store, and just abut everything you'll need. 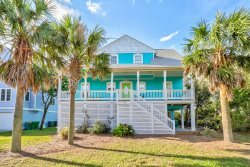 Come enjoy our beaches and relax in this beautiful Southern beach home. You'll be glad you did. Everyone we talked to was polite and helpful. When there was an issue, it was addressed quickly and effeciently. We stayed at the Ohana house in Kure Beach. It was clean, and well maintained. Most of the windows did not have screens, and the temperature was surprisingly warm for March. It would have been nice to have been able to open the windows. Otherwise, everything was great, everything worked well and all the essentials were present. All the people at A1 were very nice and easy to work with. The Wifi was not working and David came right away and got it working. The house was roomy and beatifully decorated. The bedrooms were big and the kitchen was stocked with plenty of pots, pans, dishes, and silverware.